High tea was served at 3:30, and then it was time for our afternoon game drive. The weather was still cold and cloudy. We were joined by an Australian couple and their British cousin who lives in Botswana. We started off along the dry riverbed where we had seen the leopard in the morning, but he was nowhere in sight. For a long time the animal viewing was very sparse; we saw a few impala and very little else. Eventually we came upon a bachelor herd of male zebras. 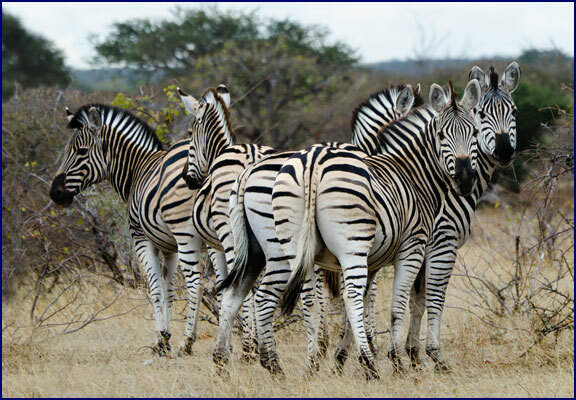 It seems that zebras are famous for turning their backsides toward people; it is easy to get a lot of photos of nothing but zebra butts. However this group posed for us beautifully, standing in a symmetrical pattern, looking back over their shoulders at us. After that our luck picked up. We were able to get quite close to both a pair of tiny steenbok and several large elands, providing quite a contrast in antelopes. We stopped to watch a dozen giraffes, browsing the treetops for their dinner. 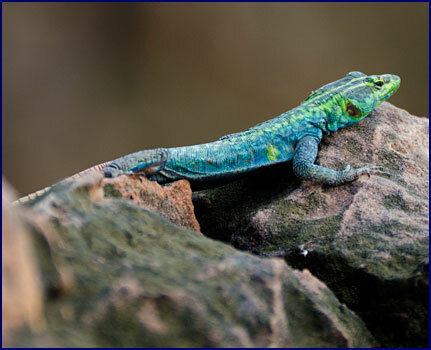 The guides are in touch with each other by radio, so if something rare is sighted everyone can have a chance to see it. 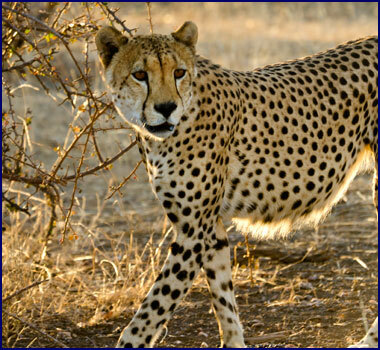 Abraham got a call that cheetahs had been seen near the perimeter of the reserve, so he hurried to the area. We found a mother cheetah lying with her six-month-old baby. The young one was intermittently nursing, while the mother purred loudly with a contented look on her face. They reminded me very much of our house cat nursing her kittens. 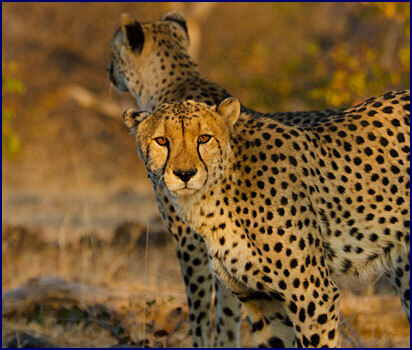 Although there were two other vehicles close by, the cheetahs did not seem worried by our presence. They were absolutely beautiful, and we watched them for a long while in the fading light. Abraham drove us to the top of a small hill for Sundowners. We really enjoyed this African tradition of finding a scenic spot and watching the sunset while enjoying a drink. Jineen and I have followed a similar custom on our trips; we find the most beautiful view we can at the end of the day, and have a glass of wine and a snack. We had always called it �Happy Hour,� but decided that �Sundowners,� is a better name. We enjoyed a bottle of South African white wine and some chicken wings, and watched the sun escape from behind the clouds just in time to sink below the horizon in a brilliant red sunset. We drove back toward the lodge, spotlighting along the way. We marveled at how Abraham could sweep the darkness on both sides of the road with the powerful light and still concentrate on his driving enough to avoid running into a termite hill or aardvark burrow. We were driving slowly along a sandy creekbed in the dark, when suddenly in a blur of motion there were elephants on either side of us. We got a quick exciting glimpse of them before they vanished into the bush, transformed by moonlight into magical creatures. We got back to the lodge at 7:00 p.m., shivering with cold. In deference to the weather, dinner was served in the Winter Lounge; this was the only meal we had in an enclosed room for the entire trip. Our waitress shyly announced the menu: Hot butternut squash soup for starters, and then a choice between pork chops and oxtail for the main course. Thinking the idea of eating an ox�s tail a bit disgusting, I chose the pork chops � but they were very tough. Warthog perhaps? We set off for the morning game drive at seven, joined by the Australian couple. It was cold and cloudy again, but we had dressed warmer. I had encouraged Jineen to buy an extra polar fleece jacket at the gift shop, so I wouldn�t have to watch her shiver. As we left camp, Abraham pointed out an area where the lawn had been rooted up by bush pigs. They had really made a mess of it � the groundskeeper would probably like to make bacon out of these nocturnal relatives of the warthog. We stopped by the hyena den. The mother and her baby were out lying on the rocks again, and the older baby peeked out at us from a crevice. We watched them a few minutes and then continued on. 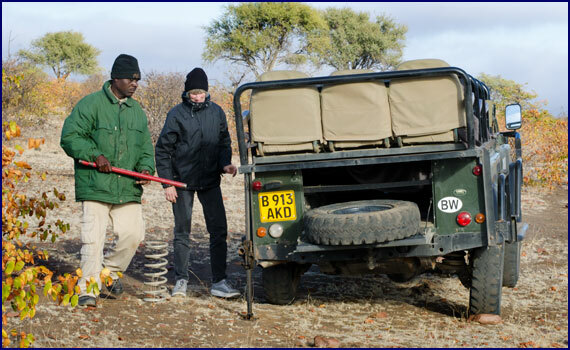 The Landrover was quite good over the rugged terrain, and Abraham drove it in places where I wouldn�t have guessed a vehicle could go. But crossing a sandy gully we became quite stuck, wheels spinning futilely. Then with a sudden lurch the �rover pulled free, but after that we noticed the vehicle had a definite list to the left. It was an elephant morning. We encountered several large family groups with babies, and they allowed us to come quite close, to watch and photograph them. They appeared serene and dignified, with their wise wrinkled faces, like they knew all and had seen all, the wisdom of millennium on their granite heads. Shafts of sunlight broke through the clouds, making the landscape glow, and there were patches of blue in the sky. By now it was obvious that the Landrover was tilting badly to the left � as we drove over the uneven terrain I had to lean hard to the right to avoid sliding off the bench seat. Realizing that he hadn�t noticed, we brought it to Abraham�s attention; he got out to check and found we had lost a rear spring. He turned the vehicle around to look for it, backtracking about a mile before retrieving the spring from the gully where we had gotten stuck. Abraham jacked up the �rover and made the necessary repairs. The clouds cleared away, at least temporarily, and the sun came out as we drove across the open plain. We could see giraffes in the distance; their long necks and heads sticking up above the scrubby trees reminded us of the Diplodocus dinosaurs in Jurassic Park. Jineen came up with a name for it: Giraffic Park. We found our cheetahs from the night before, the mother and the half grown cub. They walked regally across the savannah to a leaning tree then proceeded to climb it, one at a time. After coming back down, they lay in the shade of the tree and licked each other�s faces. After a few minutes they started to wrestle and play, and then they licked some more before finally settling down for a nap. We returned to camp just in time for brunch. 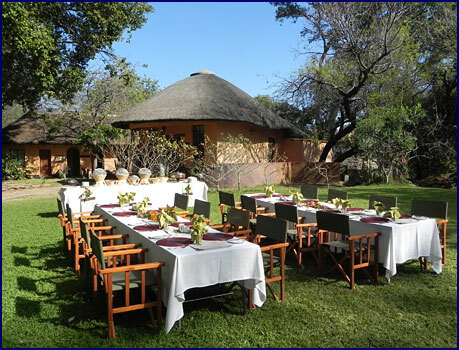 One of the unique and excellent things about Tuli Lodge was that each meal was served in a different location; this time we ate on the lawn just outside our cabin. After brunch Jineen and I went for a bush walk with Simon. Everyone else visiting the camp seemed content to spend the middle of the day resting or hanging out by the pool, but we didn�t want to miss a single moment that could be spent in the bush. A walking safari is a great way to experience all of the small things that are easy to miss from a vehicle. We found a leopard tortoise shell, with brightly marked sections of yellow, orange and black. This prompted Simon to tell us the story of the leopard tortoise, and how he came to have his shell divided into segments. The gods were having a big feast in heaven, and the birds were all invited to attend. The leopard tortoise really wanted to go, so all the birds agreed to give him one feather each, so that he could fly up to heaven with them for the party. The chief bird told him, �your presence will be a gift for all of us.� So the tortoise took �All of us� as his new name that the birds had given him. The turtle flew up to heaven and saw the great feast waiting. �This food is for all of us,� said the gods. The leopard tortoise, overcome with greed, said that since the birds had named him �All of us� the food was for him, and then he proceeded to eat all of the food, leaving none for the birds. Of course this angered the birds, so they took back their feathers, leaving the turtle no way to get back down to earth. He did manage to get one of the birds to take a message to his wife, asking her to find many pillows and pile them up together. He then leapt from heaven and fell to earth, landing on the pillows to break his fall. However it was a very long drop and there were not enough pillows, so he bounced off of them and hit the ground, where his shell was shattered into many sections. He survived, however, and his broken shell was glued back together. And from that day forward, the leopard tortoise has had his segmented shell. Every safari guide will talk about the Big Five. These are the five animals that are considered the most dangerous to hunt; elephants, leopards, lions, buffalo, and rhinos. But Simon introduced us to what the guides have dubbed the Little Five: The elephant shrew, the leopard tortoise, the ant lion, the buffalo weaver, and the rhino beetle. So far we had three out of five. We headed back to the lodge, walking slowly across the wide rocky flats. A magnificent pair of baobabs stood in front of the high rock formation, stark against a backdrop of dramatic clouds. Their enchanted appearance stirred the imagination. A pair of klipspringers gazed at us from the top of the ridge. We returned to camp on the steep rocky path by the waterfall. 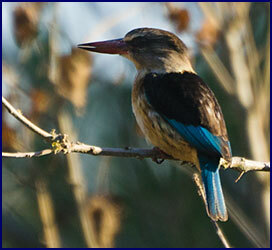 As we came down to the lawn we saw a flash of iridescent blue � a woodland kingfisher flew by, soon joined by another. We thanked Simon for the bush walk, and then set out after the kingfishers. We followed them around camp as they flew from tree to tree, trying to get close enough for a good photo. We explored a little trail through the trees and along the river. There were deep burrows in the woods, made by aardvarks digging for ants at night. We could see marks where the warthogs had been rooting up the forest floor. The sound of birds singing and the cooing of doves filled the air. We had a couple of free hours before tea, so we climbed back up the steep path to the top of the rocky escarpment. 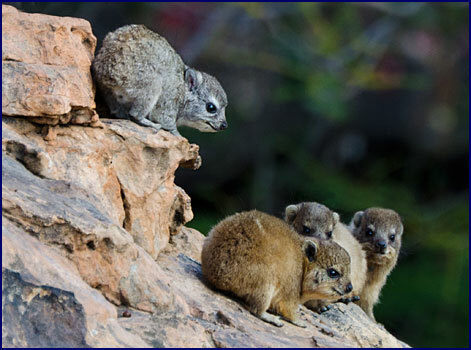 A family of rock dassies peered out at us, the babies scampering among the rocks. A dark blue starling watched us from a nearby crag. There is a flat area at the very top of the outcrop, with benches and a railing, called the Star Deck. We stood there and looked down over the plain. Although it didn�t seem like we had climbed that far, from the deck it felt like we were above the world. We stayed for a while, enjoying the company of the birds and lizards. After high tea we went out for the afternoon game drive. The Landrover was quite full this time, with eight passengers; three on the bench seat was a bit cramped for photography. We set out on a track that went along the Limpopo River, searching for crocodiles. We saw beautiful scenery and lots of birds, but no crocs. We left the river and followed a track through a rocky area to a small watering hole, and there we found our crocodile. It was not very large, but we were still surprised to hear that it was probably just a few months old � Abraham said they need to grow up fast or something eats them. We drove quite a long ways through a bare area, seeing relatively few animals. 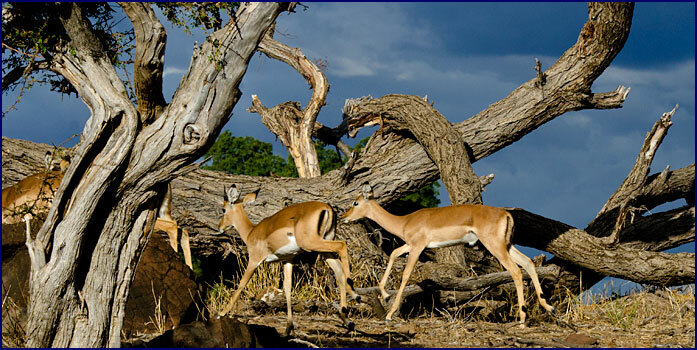 As dark storm clouds gathered on the horizon, a herd of impala darted past the vehicle, leaping high in the air as they ran. We passed a couple of zebras and wildebeests, two ostriches, some elands, and one giraffe. We saw a lone elephant on the horizon. Abraham suddenly stopped the �rover; we looked to the right and saw a black-backed jackal beneath a tree. We were admiring this attractive foxlike canine, his chestnut coat marked with silver and black, but that was not why Abraham had stopped. �Look, look!� he urged us, directing our attention to the left. 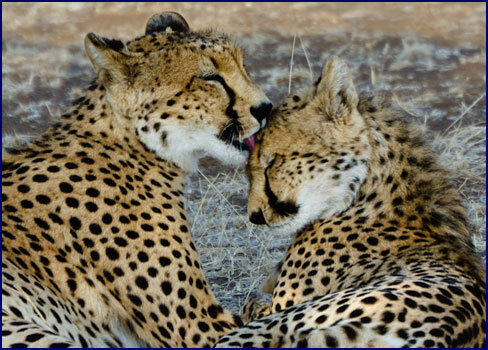 There were our two cheetahs, mother and half-grown youngster, their faces smeared with blood, eating a freshly killed impala. We watched them feed in the fading light, and the jackals also watched, waiting their turn. Abraham explained that the cheetahs need to eat fast, because once it gets dark the jackals will call out, and the hyenas will hear and come to take the kill from the cheetahs. 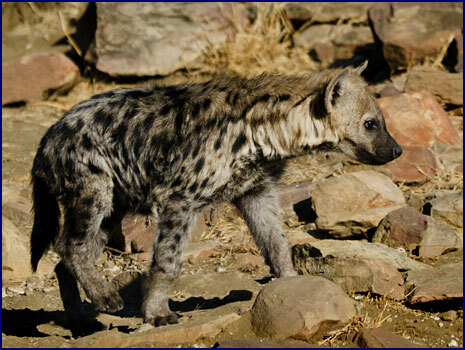 The hyenas repay the favor by sharing the kill with the jackals. 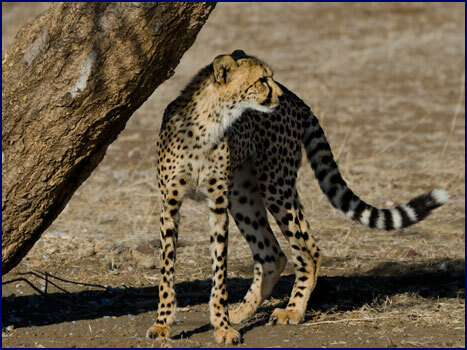 This is one of the main reasons why cheetahs hunt in the daytime instead of at night. We left the cheetahs and headed across the plain; the sun was starting to set and the sky was on fire. A huge baobab tree stood alone against the backdrop of the magnificent African sunset, its trunk gleaming in the last horizontal shafts of light. This was our Sundowners destination. The baobab was massive, more than 30 feet around, and Abraham said it was over 800 years old. The sunset was spectacular, with incredible hues of orange and magenta stretching 360 degrees around the horizon. Near the earth�s poles the sun travels somewhat horizontally as it sets, so that the waning light lasts a long time. In Africa, close to the equator, the opposite is true � the sun seems to drop straight down like a stone. With the far horizons and clear air, the sunsets are brilliant but short-lived, and the darkness comes on suddenly. 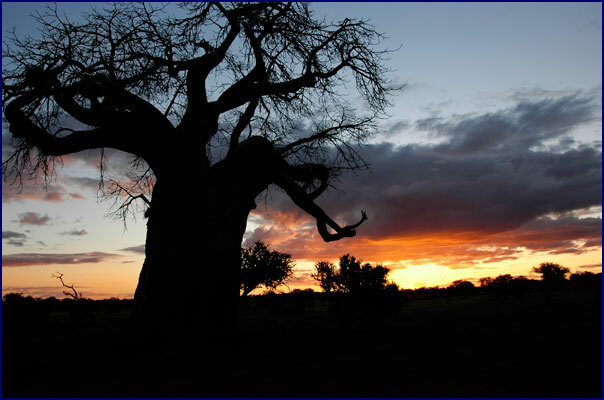 We had wine and snacks beneath the mighty baobab, and enjoyed the spectacular evening. Dinner was served in the bush. After spotlighting our way back to the shelter where we had stopped for Sundowners on the first night, we sat around the campfire with drinks while the staff cooked dinner on the braai (an open-flamed grill). Tables were set up on a wide patio bordered by a low stone wall, overlooking the water hole. Hyenas lurked just outside the ring of firelight, attracted by the smell of roasting meat. We dined by the light of storm lanterns. An ant lion, drawn to the flame, fluttered onto our table � the fourth member of our Little Five. Our waitress announced the menu in a shy voice; we started off with bleu cheese soup. This was followed by chicken kabobs, sausage, pork chops, jacket potatoes, and a grits-like substance made out of mielie meal, a Botswana staple made from maize � all cooked on the braai. After dinner the Tuli Choir sang for us, and performed a shuffling traditional dance around the fire. What an amazing evening. Up at six again, and after a cup of tea and a quick bite of breakfast, we were driving out the back gate of Tuli Lodge with Abraham, heading up a steep rocky slope. It was still cold, but this morning there was not a cloud in sight, and the sun shone brightly in a deep blue sky. It was a welcome contrast to the mostly cloudy weather and overcast skies of the last three days � and in fact, from that moment on we did not see another wisp of cloud for the entire duration of our trip. We passed a man on the road near camp; he was waiting for a bus. He told Abraham he had seen something go up over the hill that may have been a leopard. Abraham drove the Landrover straight up over the rock outcropping in pursuit, traversing through steep gullies and ravines. We continued to search the rough rocky area, without benefit of any roads or tracks. It is unbelievable how rugged these �rovers are, and it was a wonder we had any tires left, let alone springs. There was nothing moving up on this high ridge, not even a klipspringer. Abraham continued to search for the leopard, driving the slopes at unlikely angles. It was like something out of a commercial for Landrover, where they drive a vehicle up onto some inaccessible peak to prove its ruggedness. Presently we gave up the leopard hunt. We came down out of the rocks and set off across the plain. The bright sunshine engendered a sense of exhilaration. Jineen gestured at the brilliant blue sky above and quoted, �The sun rolling high in the sapphire sky,� a lyric from The Lion King. From then on, Elton John�s version of The Circle of Life ran through my head on every game drive for the rest of the trip. We saw a couple of zebras, a crowned plover, and a brown snake eagle sitting high in a tree. 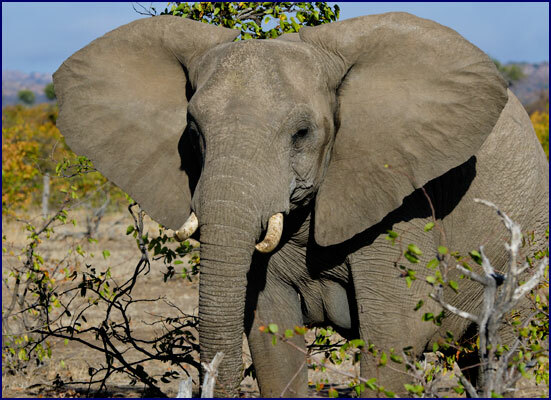 Then we located a herd of around thirty elephants, including the smallest baby we had yet seen � Abraham said it was probably only about six months old. We parked on a knoll where we could watch them, and had a cup of tea. 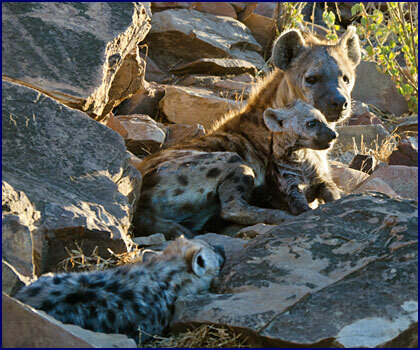 We drove by the hyena daycare center; the mother and the two youngsters were lying in the usual spot. The mom got up and crossed the track in front of us with the larger baby following; the smaller one hid, peeking out at us from behind the rocks. Brunch was served on the lawn, beside the cliff overlooking the river. We watched the birds and checked for crocs in the river. A smallish black bird with a long forked tail sat on a branch above the table � Simon said it was a fork-tailed drongo. It waited for an opportune moment before swooping down suddenly to make a raid on the breakfast plate of the British man sitting across the table. But at the last moment it lost its nerve and panicked; it was hard to say who was frightened more, the man or the bird. The drongo flew back up on the branch above the table for reconnaissance, but never gathered the courage to make another strike. We packed up our bags and said goodbye to Tuli Lodge. 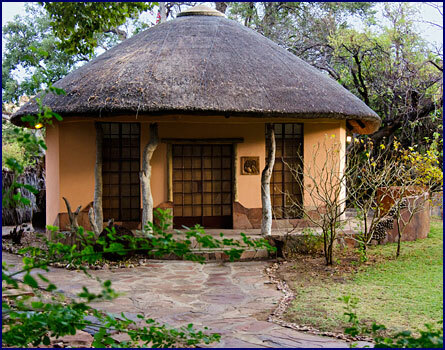 It was time to head for our next destination, the Mashatu Tented Camp.